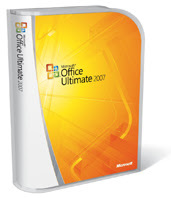 Cheap Microsoft Office Ultimate 2007 Edition, only $60! ...For college students, that is. Microsoft has recently launched its latest promotion called "the Ultimate Steal" wherein the company is offering their latest Microsoft Office Suite for only $60 to college students. The promo will run until April 30, 2008. Not all college students may be eligible for this offer. According to the Ultimate Steal website, in order to be eligible, college students need to have valid email address at a U.S. educational institution ending in .edu and be actively enrolled in that institution with at least .5 course load. In addition to the previous eligibility requirements, students should also be able to provide Microsoft in a proof of enrollment status such as a student card. If the student fails to provide Microsoft with a proof of enrollment, they have to pay the full retail price of the Office Ultimate 2007. According to Microsoft, retail price for the Office Ultimate 2007 is $679. The Suite includes applications such as: Access 2007, Accounting Express 2007, Excel 2007, InfoPath 2007, Groove 2007, OneNote 2007, Outlook 2007 with Business Contact Manager, PowerPoint 2007, Publisher 2007, and Word 2007.